After working on bombers and tankers for seven years, I was sent to McGuire Air Force Base New Jersey, McGoo Air Plane Patch. I was moved from the Strategic Air Command, SAC, to the Military Airlift Command, MAC. The airplane there at the time was the C-141A. Actually it was just the C-141. The A wasn't added until they started stretching them. Then the A became the B. My first night on the flight line, I was sent to parking location N2, or Nancy Two, to do a preflight on aircraft 183. On approach to the plane I noticed a drop of fluid fall from number three engine. Pulled out my 3/16th rag wrench and proceeded to find another drop of fluid. Opened up the accessory doors and a half inch nut hit me on my forehead. Got to looking and saw the hydraulic pump had a missing nut. Went to bench stock, got a half inch locking nut and replaced it. The fluid was just residual from the engine shut down. But was my first impression of the plane. Which supports the belief that after it flies one time, it's broke until it hits the bone yard or the trash can. You let me look long enough at an airplane, any of them, and I'll find something wrong. MAC had a you call we haul policy. With SAC, other than training missions, there had to be some sort justification to start dropping bombs. There within and between these two major United States Air Force Major Commands there were two cultures of mechanics; there were two cultures between the flight crews too. And it was the mission that dictated how these people operated, as teams. In SAC Crew Chiefs stayed with their plane and it was not uncommon for a Crew Chief to come out to his airplane on one of his days off and polish his engines, or replace a floor board or something. MAC's Crew Chiefs seldom ever saw their planes. Operations and Maintenance had fewer issues in SAC than in MAC. The Mission dictated that too. In SAC unless we were dropping bombs, it was pretty much like US post office hours. In MAC it was 24-7. 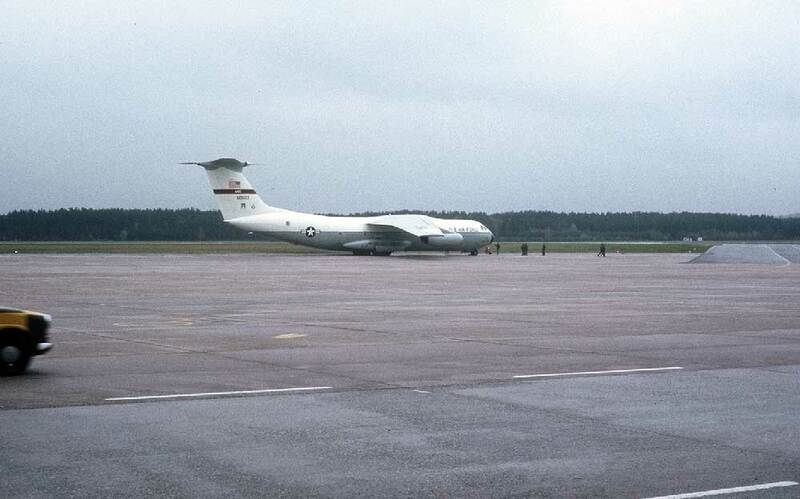 My tenure with the C-141 lasted for about 14 years and two bases, McGuire New Jersey and Rhein Main Germany. The positions I held was; Ramp Rat, Crew Chief, Expediter, Assistant Shift Chief, Shift Chief, Task Oriented Training Instructor, Engine Run Instructor, Assistant NCOIC of the Tool Room, NCOIC of the Tool Room, Safety NCO, Enroute Expediter, Enroute Team Chief, Enroute Controller, Senior controller, Line Chief, and I know there's more. In the early days of working on a USAF flight line there were three Squadrons which actually did the maintaining on all airplanes. AMS, FMS, and OMS. AMS or The Avionics Maintenance Squadron is where you could find shops like the Instrument shop, Radar Shop, Doppler Shop, INS Shop, and the Radio Shop. They had folks they could dispatch out to the flight line and they had folks that worked in the shop, fixing black boxes mostly. FMS or The Field Maintenance Squadron is where you could find shops like the Machine Shop, Hydraulic Shop, Sheet Metal Shop, Pneumatic Shop, Ground Support Equipment Shop and the Aero Repair Shop. They had folks they could dispatch out to the flight line and they had folks that worked in the shop, fixing black boxes or other parts. OMS or the Organizational Maintenance Squadron is where you could find the people who performed all of the inspections and servicing of fuel, liquid oxygen, oil, hydraulic fluid, systems testing, towing, jacking and the 780 equipment: seats, stanchions, oxygen bottles, wenches, etc. Job Control was the place that coordinated with Operations and the brass to bring the orchestra together that got the airplane off of the ground. This is where the 'you call we haul policy' met the ground. During the daily life of an airplane with 4 or more engines in the Air Force: After landing OMS would marshal the plane onto a designated parking spot, the crew and passengers would depart the plane. Then OMS would refuel the plane for it's next mission, inspect it, then top off the liquid oxygen, while the write ups from the inspection are called into job control. From there the different shops within AMS and FMS would be dispatched to the flight line to clear the write ups. About 8 hours before take off OMS would inspect the plane complete the paperwork and sign over the plane to Operations. On paper, theoretically, it sounds good, and it worked for SAC beautify. But MAC had some flaws with it. The whole thing revolved around the Crew Chief System. In SAC a person who was called the Crew Chief stayed with his plane. Anywhere the plane went the Crew Chief went too. Mac was a different story. If the regular crew chief was to be sent with their airplane, it could be a very long time before they saw home. So as a general rule if your name was on the side of an airplane, it was very seldom you would even see your airplane much less work on it. Configuration changes were nonexistent in SAC. Their mission stays the same: Take bombs to a designated target and drop them. In MAC configuration changes were the norm. The incoming mission could be setup for passengers and the next mission out would be for patients. That's a lot of work to remove the triple passenger seats and install the stanchions with litters and red side seats. To make a long story short, when ever a mission came down there would be a lot of work by a bunch of people to make it happen. There was always something that could be done to help things or speed up the process. There are a lot of tail numbers that I remember. But 66-0183 sticks out the most. One night at Rhein Main AB, we were notified of a 141 coming in with an in-flight emergency. The emergency was the landing gear would not lower. There was an operation sky hook established. This is where a party line is established with everyone on the phone listening in; Maintenance, Operations, Fire Department, and Security. He was patched into my hand held radio. I ask if he could pull some negative G's to see if the gear would drop out of the wheel wells, but that didn't work. After the plane landed it stopped and shut down engines at the end of the runway. Being we shared the runway with the Frankfort Airport we had to expedite the removal of the aircraft from the end of the runway. When we got the aircraft to the parking spot we saw where the flight crew had actually poked a hole in the left side of the fuselage to pry the gear down. We also found the step one cable for the emergency extension of the landing gear which appeared to have been diked or purposely cut by someone. This is about all we did that night as it was about time for our shift to end and we were about to take our three day break. When we came back from our break I noticed 183 still there. My turn over said that there was an interconnect valve on order and it would be in tomorrow morning. They had replaces the step one emergency gear extension cable. I went on with my routine task as 183 was not much of a priority for the moment as other aircraft needed more attention. At about 0300hrs, that's 3 AM for you civilians, our work, was caught up and I decided to go ahead and remove the old interconnect valve and have everything ready for the next shift to install it as soon as it came in. This was an attempt to help things along so another mission could be accomplished by the airplane in as short of time as possible. Just so you know, the interconnect valve ties the number 3 hydraulic system to the number 2 hydraulic system. The number 2 hydraulic system, runs off of number one and two engine hydraulic pumps, and operated the primary flight controls and landing gear, while the number 3 hydraulic system was designed to operate systems on the ground. After disconnecting the hydraulic supply line and looking at the inside of the manually operated valve, I couldn't find anything wrong with it. My trouble shooting instincts had my curiosity meter pegged out. This is not rocket science, its Lockheed science. About a 10 gallon tank with red fluid a couple of feet from a good valve that we were about to change because no fluid is coming out of a 2 inch diameter line connecting the two. I opened the cap on the tank and there was red fluid. So I proceeded to take off the 2 foot by 2 inch diameter line. After getting the lock nut off, as I started to pull the line away from the tank there looked like a brown paper filter in the line, looked just like the fuel filter on Papa's tractor. Then I got to thinking: Why would there be a paper filter in a 2 inch supply line that is pressurized to 2000 psi? So I pulled the line out a little more, then the obvious wad of paper towels flopped onto the tank of the hydraulic reservoir. It took me a minute to realize what I had just discovered. Someone was trying to crash this girl. Went back to the office and got on the telephone, this was the days before cell phones and the internet. Discussed the situation over with the Senior Controller in Maintenance Control and he notified security who call the OSI, Office of Special Investigations. The aircraft was quarantined and every person going in or near the plane had to sign in and out. When we took off the engine hydraulic filters, the filters were stuck in their cups with soap, and there were pieces ear plugs and paper towels on the filters. When we checked the aileron, flap, elevator, and rudder pack filters we found the same thing. Before this plane could fly again the whole entire hydraulic system had to be flushed. This had never been done. We got together with a Lockheed rep and devised a plan which included fabricating some special hoses and got it done. Did a full systems ring out on everything and sent her on her way. I sat for two full days in a sound proof room being questioned by an OSI agent. I heard later that they thought someone back at McGuire had put soap packets, ear plugs, paper towels, and packets of handy wipes in the number two hydraulic system, and then diked the step one emergency gear extension cable. They say that flying is hours upon hours of boredom interrupted by moments of shear terror. I do hope they caught the person who helped to bring shear terror to all of those folks that night.